On 4 June 2010, the Cabinet Committee on European Union Affairs adopted the proposal for Finland’s strategy for the Arctic region which was presented to the Committee by a working group appointed by the Prime Minister’s Office. The Arctic strategy focuses on external relations and discusses issues relating to security, the environment, economy, infrastructure and the indigenous peoples in the Arctic, as well as international institutions and the Arctic policy of the European Union. 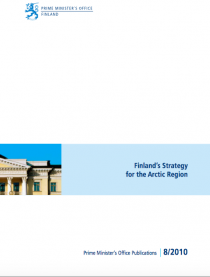 The strategy defines Finland’s Arctic policy objectives and discusses ways of promoting them. Proposals for the development of the EU’s Arctic policy are also presented in the strategy. Arctic policy issues have risen to the centre of attention in international politics in recent years because of the climate change. Finland was the seventh of the eight Member States of the Arctic Council to publish its own Arctic strategy. The strategy provides a more comprehensive overview of the Arctic region and specifies concrete objectives for future policies in Finland. It makes proposals for action in areas such as the improvement of transport connections, promotion of exports in the Arctic, Arctic research and strengthening the role of the Arctic Council. The Advisory Board on Arctic Affairs appointed by the Government will have a key role in further work on the strategy.